Anyone visiting Ibiza this year cannot have failed to notice the absolute explosion of art hitting its whitewashed, sun-drenched streets. We've seen Urban in Ibiza making a splash with live art performances at Atzaró and Bloop International Art Festival creating huge murals on walls and buildings around the island. Several venues such as Boutique Hostal Salinas and Nagai restaurant have commissioned stunning street art ‘makeovers' by luminaries such as London West Bank Gallery exhibitors, Inky and Finn Dac. Local charity, Care for Cats Ibiza have also dipped into the art world this year, featuring a special, limited edition tee-shirt designed by Ibiza's very own resident DJ and street artist extraordinaire, Scott Gray (aka Chapter) plus an art auction to raise much needed funds for the animal charity. Hell, we even stumbled across live art performances at Las Dalias during Wax da Jam and at Somiart restaurant in Santa Eulalia, who regularly play host to local artists, painting their masterpieces right there in front of your eyes as you demurely nibble on your bread and olives. 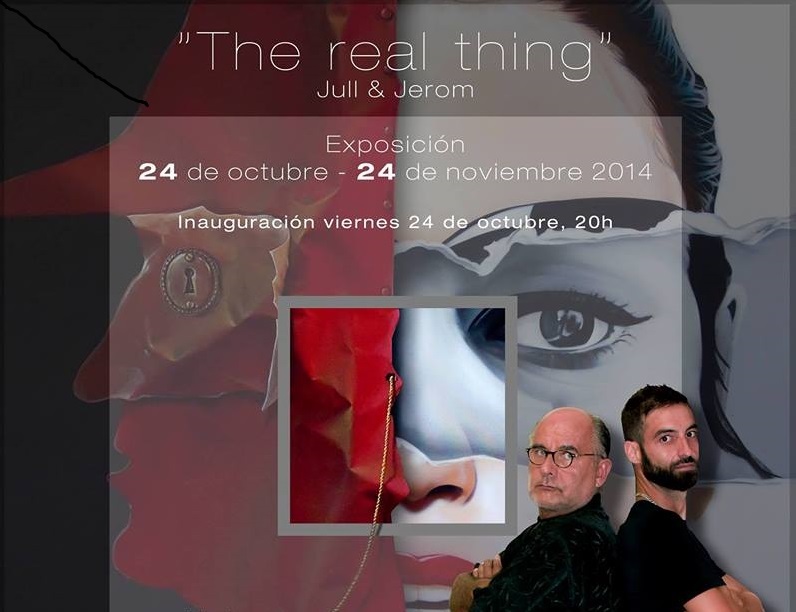 Next up in the Ibiza world of art is an exciting new exhibition, The Real Thing, starting this Friday October 24th, lasting one month and which will showcase the brilliant work of native Ibiza artists, Jerom and Jull. Many of you will already be familiar with the work of Jerom, who has for years been gracing what would otherwise have been eyesores on our beautiful island, with his vibrant, unique and quite often, polemic pieces of street art. Jerom's traditional canvases you see, were the walls and public spaces of Ibiza. His background comes from the world of Graffiti, with Jerom creating strongly arresting images in his signature style of Hyperrealism. This is a genre that at first glance, seems to show a ‘realistic' representation of life, like a photograph. But upon closer inspection, the image is revealed to be created meticulously using spray paints. Politically aware, Jerom's work often comments upon important social issues. An example of this social element of his art would be Jerom's contribution to the ‘Ibiza Says No' movement, which saw him collaborating with local children on the creation of a huge mural on the wall of iconic Ibiza super-club, Amnesia. The mural was a strong statement condemning the plans for oil drilling off the coast of Ibiza, a project almost unanimously rejected by residents of the island. Jerom's extraordinary talent was also chosen to represent Ibiza beer connoisseurs, Payesa, who now use his artwork which is seen all around the World. Jull, an exceptionally talented Ibiza artist produces meticulously precise, intricate and unusual landscapes by combining Surrealism with Hyperrealism. His images are often dark, intense and extremely thought provoking. Surrealism has much history in Spain and in Cataluña in particular, which of course includes Ibiza and all of the Balearic Islands. Both Salvador Dalí and Pablo Picasso for example, were respectively native to, located and schooled in the area, providing a rich source of cultural influence within the local art scene. Ibiza itself of course, has been long synonymous with the world of fine art. One only has to stroll through the villages of the island and pop into what look from the outside like humble local bars to stumble across the most incredible impromptu art galleries. These ‘galleries' were formed as local artists, often struggling to make ends meet, swapped paintings for food with the local eateries. Check out Bar Costa in the central Plaza of Santa Gertrudis and Anita's bar in San Carlos for just two examples of this art-loving, Ibiza tradition. Jerom and Jull represent the very best of contemporary art, produced in Ibiza, by Ibicencos. Their level of skill is incredibly high and they're both considered as serious players in their field. Their month long exhibition is already attracting international excitement and anyone serious about love for art should absolutely not miss it. In fact, anyone with even a passing interest in cutting-edge, contemporary art would be very well advised to check it out. Kudos to Payesa Ibiza and Feel Good health salon down on Ignacio Wallis for sponsoring the event and supporting the work of local artists. See you at their inaugural event on Friday, October 24th from 8pm at Galería Exibizanismus, Vía Púnica 57, 07800 Ibiza. For a map of the location just click here. The gallery is open every evening from 8-11pm and the exhibition runs until January 15th. Free entry.